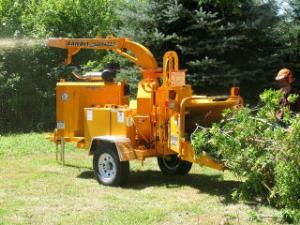 The 12" towable wood chipper can chip brush, limbs, and whole trees. The machine features a feed rate of 90 ft per minute, and the dual feed wheels help to pull and compress material into and through the chipper. The discharge chute can be spun 360 degrees for convenient chip placement. Other features of this unit are hydraulic lift for the feed wheels, which spaces them apart for wider material, and a hydraulic winch to pull heavy trees to the machine. Chipper runs on diesel fuel, and a $100 deposit is taken so machine is returned full. It requires a standard pintle ring to transport unit home, and local delivery is available, with rates varying by distance. * Please call us for any questions on our chipper 12 inch rentals in Hillsdale and Ridgewood NJ.